This was a fantastic match. If by fantastic, you mean needing a defibrillator every two minutes just to survive. It was a little frightening to see glimpses of Inter’s full potential, something De Boer had kept blissfully concealed in his fabulous 85 day tenure. Because after spending so very much on such talented players, Inter should be frightening. Particularly while maintaining 66% possession against Montella's world famous possession-based team. Not tonight, though. Despite them coming out like a barrel of gunpowder in a fire, they were held back by a bunch of kids. Kids who, if the man of the evening had managed his club better, would still be playing with the Primavera or sold for cheap to other clubs. Yes, those kids whose brilliance have carried the team on their young backs this season. Then there is this young guy called Suso. Left on the bench and even loaned out to Galliani’s foster care club previously, he has been phenomenal under Montella. So despite all of Inter’s millions of euros running around (remember Kondogbia? Hahahaha,) it was Suso’s individual brilliance that opened up the scoring. With an exquisite shot that was like a guided missile, he beat the veteran Handanovic to make it 1-0 Milan in the 42nd. If I remember correctly, we paid Liverpool €1.3 million for that guy. Compare that to the €70m Inter dropped on Joao Mario and Gabigol in a single day this summer, the latter of which was a very expensive bench warmer again today. 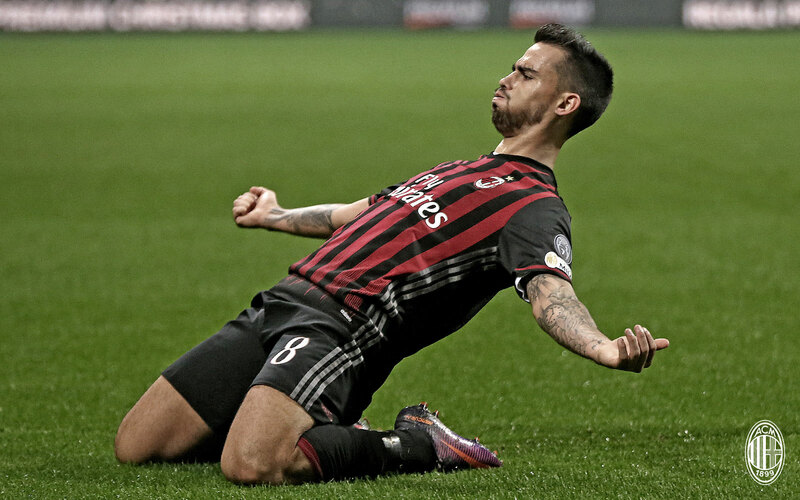 I’ll keep Suso, thank you very much. As I tried to bring my blood pressure back down to a level that didn’t require medical intervention, I wondered how the teams would come out after the half. And I was most pleasantly surprised. Our kids were all hopped up on the drug that was Suso’s incredible goal, and Inter were the ones who seemed a little frightened. Not frightened enough, though, as Candreva scored the exquisite equalizer in the 53rd. 1-1 all. But Suso was not going to let Inter take his glory, so five short minutes later, he showed his massive skills and ambidexterity with another amazing goal. 2-1 Milan. But since misery loves company, we had to know it was too much for Milan to withstand the 21 shots (six on target) that an energized Inter would send Donnarumma’s way. Although through all of Montella’s subs and for 34 minutes, we did withstand. Montella’s subs included Mati Fernandez on for Bacca in the 71st, Lapadula on for Niang in the 79th, and Pasalic on for Bonaventura in the 88th. All good, solid subs for once, actually. But not enough to prevent Perisic’s heartbreaking equalizer in the second minute of stoppage time. 2-2, and our Derby dreams were crushed, just like that. Inter fans seem flattered by Montella’s words postmatch saying Inter are a team built to win the Scudetto, and they were celebrating like they’d won. But what he was really saying is that Milan were a team in a five year-deep crisis, with players promoted from our youth sector rather than stars purchased to win. And Inter acted like drawing with us was some great victory. The compliment definitely goes to Milan. To Suso, who did everything in his power to win this match. To Donnarumma, who once again was phenomenal, despite conceding two unstoppable goals. To all of the other players, who fought valiantly, against the odds. And to Montella, who has instilled the belief in this squad that they could win (almost) a team with players who cost almost 40 times as much as them. This match was like watching a heavyweight boxer fight a kid, and the kid nearly won. That near victory may be quite bitter, but it’s also very sweet. Even six months ago, we would have most certainly lost. This was not what we all dreamed of. We wanted that Derby win, and for some of us, it’s personal. But if we can take a step back from the “almost” and look at the bigger picture, this was like a victory for us anyway. We did not hand Pioli his obligatory three points for being a new coach. Instead, we outplayed them psychologically, since they have more experience and talent. We didn’t grab our chance that Roma handed us to go to second place all alone, but we are still in third, or tied for second, however you look at it. And that is so much better than any of us dreamed after having the opposite mercato that Inter had this summer. But I can understand the misery, and misery loves company.